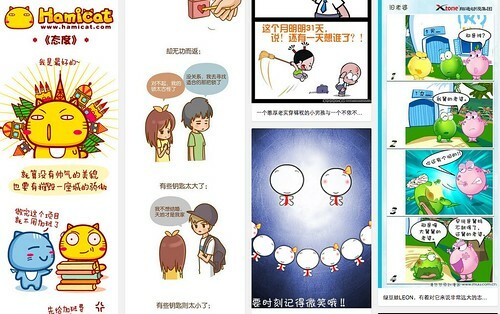 Can Project Naptha Read Chinese Text in Images? Yesterday Project Naptha hit Hacker News. It offers a way to extract electronic text from image files through a simple Chrome browser extension. Excited to see that simplified and traditional Chinese are both supported by the extension, I immediately installed the extension and tried it out. The results? Unfortunately, Not so great. First of all, the script needs to recognize the text in the image. This first step doesn’t always go too well, even if the text seems relatively clear to the human eye. Let’s look at some cases where the extension found nothing, despite the Chinese text being pretty legible. In this first case, the font is non-standard. OK, fair enough. That’s to be expected. In this next case, the text is pretty clear, but the contrast is poor. In this final example, the text is fairly clear to the human eye, but also low-res and slanted. That probably makes it difficult for the algorithm. I found the last two quite surprising, considering how clear and straightforward the text is, and also high-res. Sometimes it was relatively successful in identifying the text. 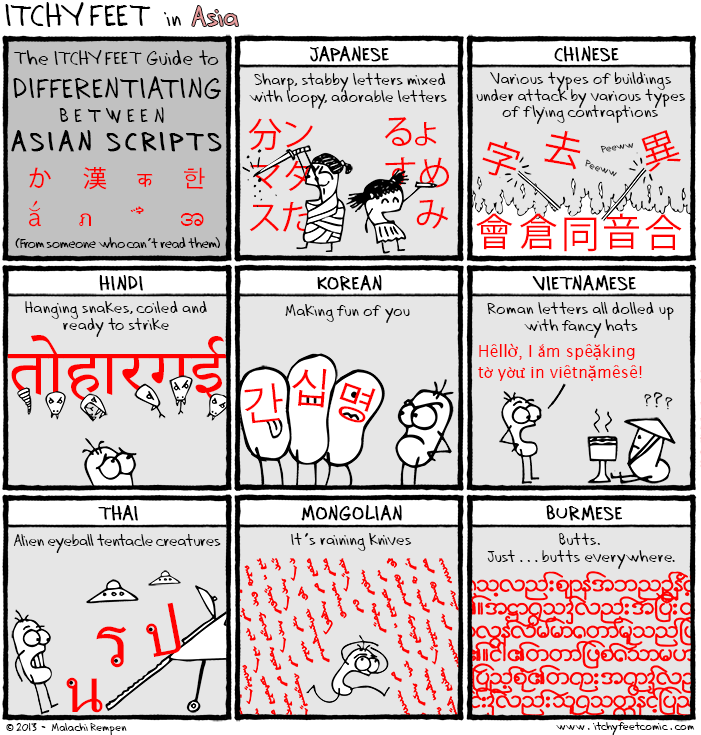 In these cases you must first set the language to Chinese (either simplified or traditional, depending on the text). There’s a cool effect showing you that some processing is going on. When that’s done, you can copy and paste the text. But… it might not be exactly what you were hoping for. Also, my sample size is too small to make any definite conclusions, but it seems like the extension works better for simplified characters than for traditional. I don’t mean to sound overly critical. This is amazing technology here, and the fact that it launched with any support for Chinese characters at all is pretty awesome (and brave)! I’m sure the technology will improve with time, and that is going to be tremendously helpful to Chinese learners. To put this in perspective, the development of OCR (optical character recognition) for mobile devices meant that you could point your cell phone’s camera at any characters you see, and get feedback on what the characters say (sometimes). Project Naptha means the same thing, but for your home browsing experience. For me, that’s when I do a lot more Chinese reading, so it’s even more important. 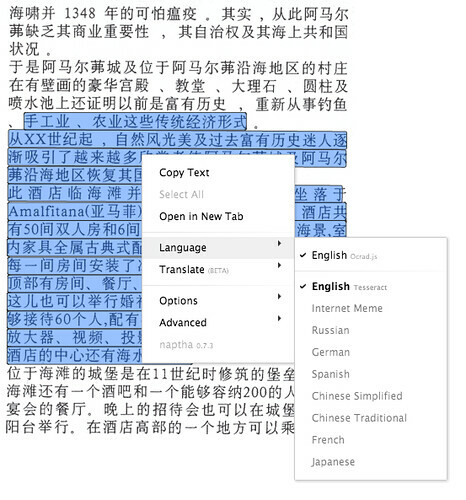 Once this technology is perfected, as long as you have a tool to help you read electronic Chinese text, you’re all set! 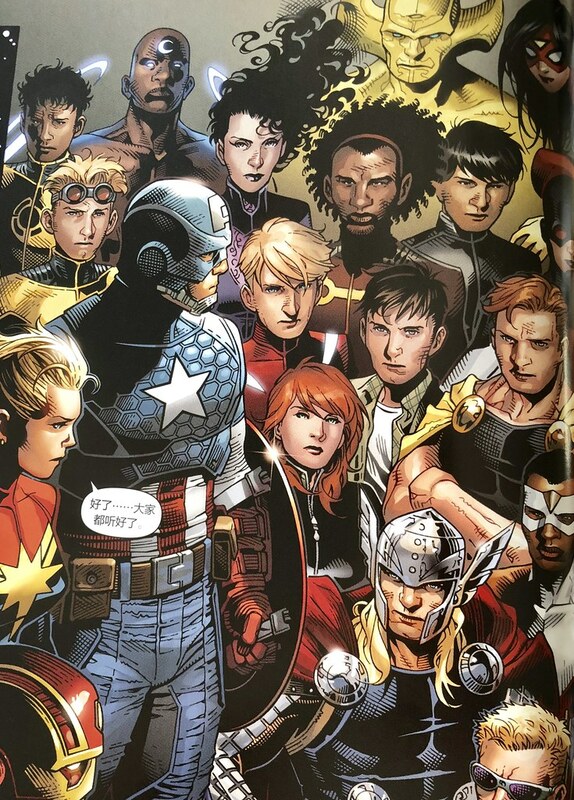 Personally, I think this is especially great news for comics. 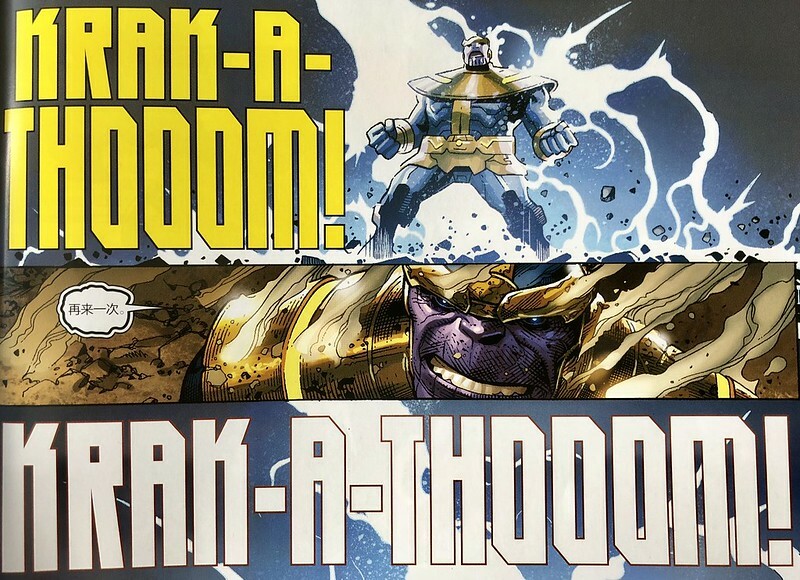 It’s no coincidence that I tested this extension out on comic book text. I’m really looking forward to seeing how this extension develops. Magnus of MandMX.com has been busy lately. You may be familiar with his Shanghainese podcast or his bilingual comics (he even did one about Sinosplice once). 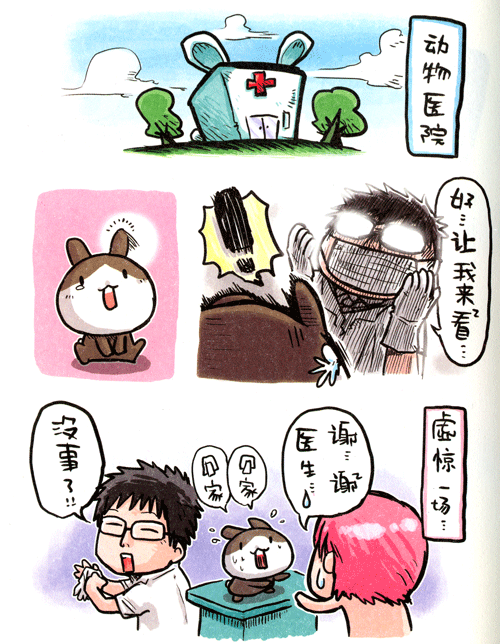 Anyway, now he’s come out with a book of his English/Chinese comics. 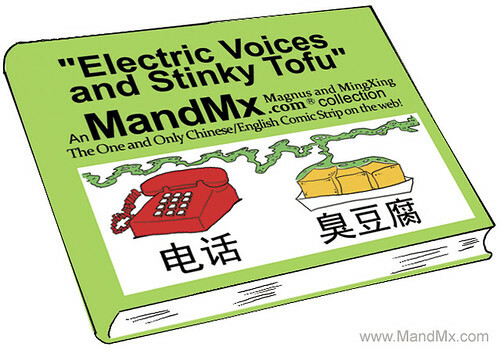 It’s called Electric Voices and Stinky Tofu (a reference to the Chinese words 电话 and 臭豆腐). Magnus was kind enough to give me an advance copy of this book to share my thoughts. I like that the book is bilingual, and that it’s focused entirely on the “foreigner in China experience.” This makes it unique. We foreigners in China all have our photos, our little private whining sessions, our blogs about life in China… but this book takes a lot of those recurring themes and distills them into one convenient collection. The book isn’t all about being funny… some of it is too true to be funny. And I daresay that most people that have never been to China won’t understand a lot of it. In some ways it’s almost like a reference book of inside jokes. I like that. 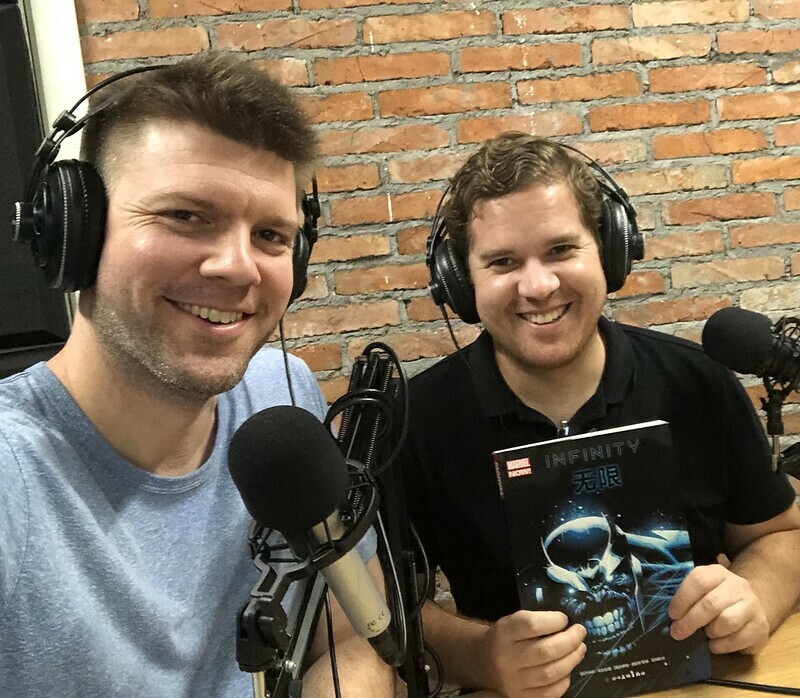 Congrats to Magnus on making this book happen. You can order it on his site. 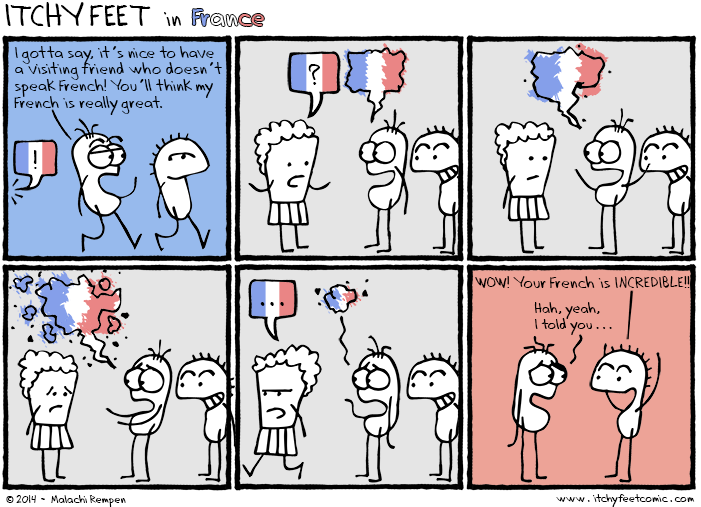 While I’d like to kick off the new year with an interesting post about language, I’ve been enjoying myself too much recently to put one together. 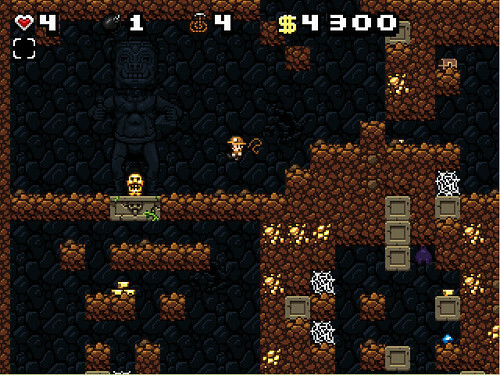 I’ve become addicted to a cool independent game called Spelunky. 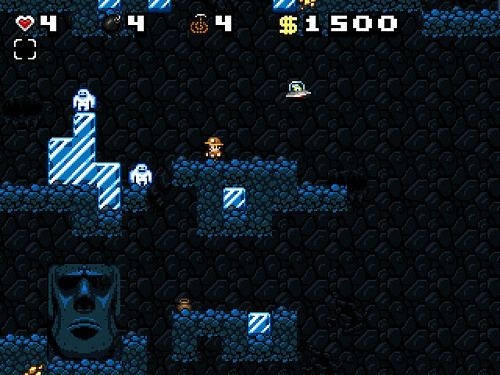 Spelunky has cool retro pixel graphics. 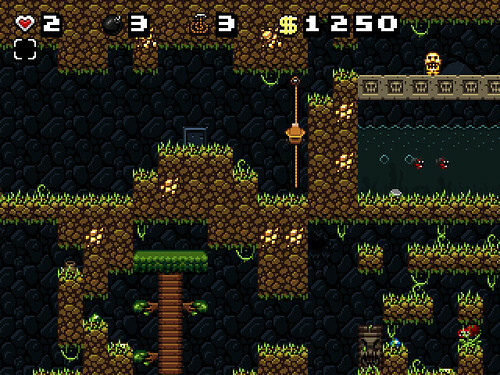 It’s kind of like Super Mario Brothers (physics) + Zelda (items) + Indiana Jones (theme). What really makes it unique, though, is its random level generation. The game most famous for this is the old 1980 classic Rogue, but Spelunky does it in a more sophisticated, fun way. You play randomly generated level after randomly generated level, knowing you will never play them again. And you die many, many times. Randomly generated levels strewn with enemies and traps are often very unfair, yet the design is sufficiently balanced and full of surprises that you keep coming back for more… again and again and again. Well done, Derek Yu. It’s innovative games like this that make me glad I still have a PC and not just a Mac. Another noteworthy diversion I’ve spent some time on lately is MS Paint Adventures, a webcomic recommended by Ryan North of Dinosaur Comics. I say “webcomic” because, well… it’s kind of weird. 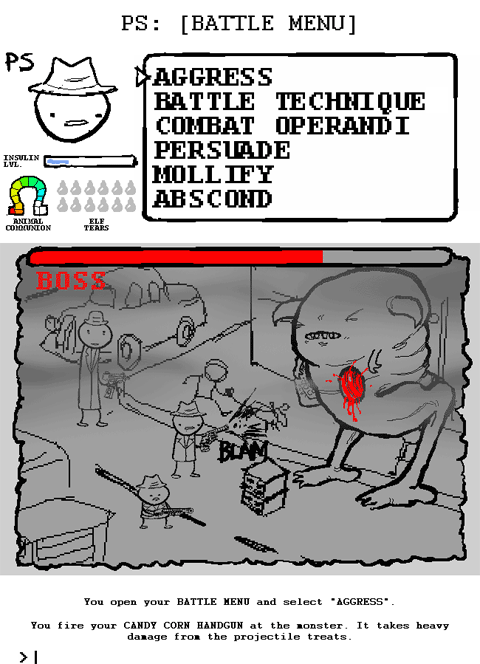 It’s a webcomic pretending to be a Choose Your Own Adventure, posing as a late 80’s Sierra adventure game (think King’s Quest or Space Quest), with elements of RPG and other adventure game genres. This one’s not for everyone, as you can probably guess by the above image. If you got all the references in my description above, though, you just might like it a lot. Have a great 2009… and don’t forget to play! 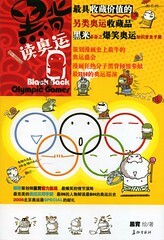 Recently at a Family Mart convenience store I encountered 黑背 (“Black Back”) comics, the creations of Zhang Yuanying (张元英). 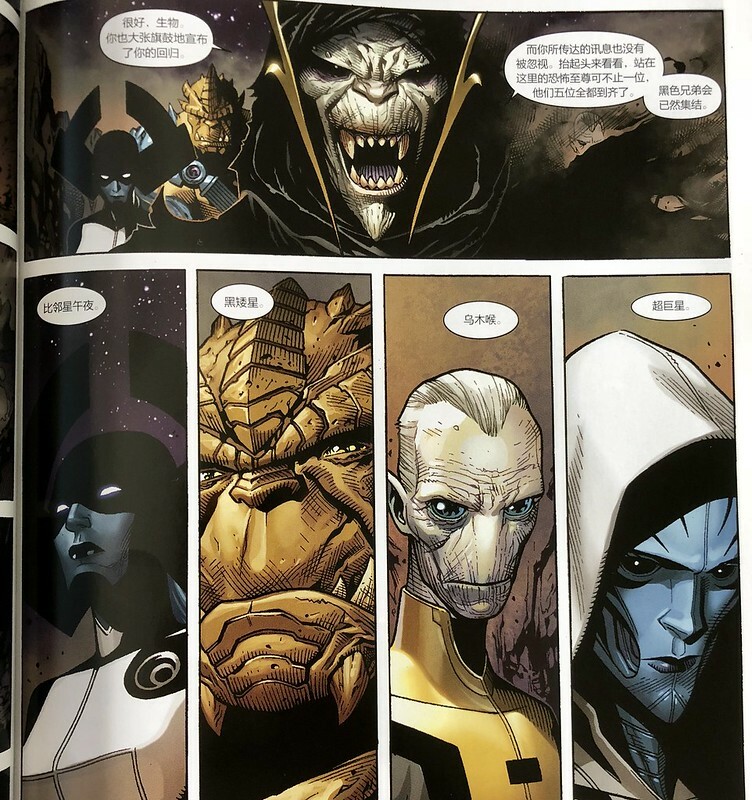 I’ve been a fan of independent comics for a while, but I’ve had trouble finding much I like in China. 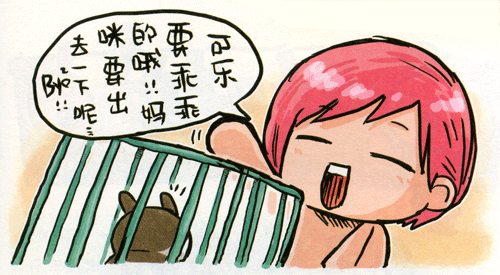 The main thing that has turned me off of mainland Chinese comics is their highly derivative nature. They all seem like copies of Japanese manga! 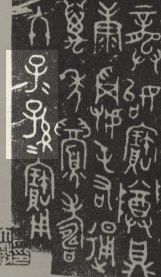 Not 黑背, though. While it does borrow some elements from Japanese manga, it has its own simple style. 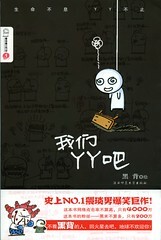 And it’s definitely darker than the comics of Zhu Deyong (朱德庸), the wildly popular Taiwanese cartoonist. A very morbid little book about suicide. It’s basically a guide to suicide in comic form, going through all the various possible methods, rating them according to various factors such as pain, chances of success, consequences of failure. Each section has a little “commentary” at the end using recycled art reminding you why suicide is actually a bad idea, which I’m 100% sure the editor (or censors?) demanded be added in so that the book can’t be seen as totally condoning suicide. OK, so I like Edward Gorey; I can deal with morbid illustrations and themes. What I really can’t forgive, though, is that the comic just isn’t very funny. I guess I did learn some new suicide-related vocabulary from it, but I hope that never comes in useful. 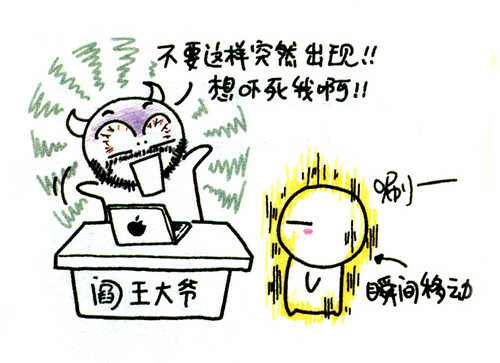 I have to admit, though, that the Mac-using devil character amused me. 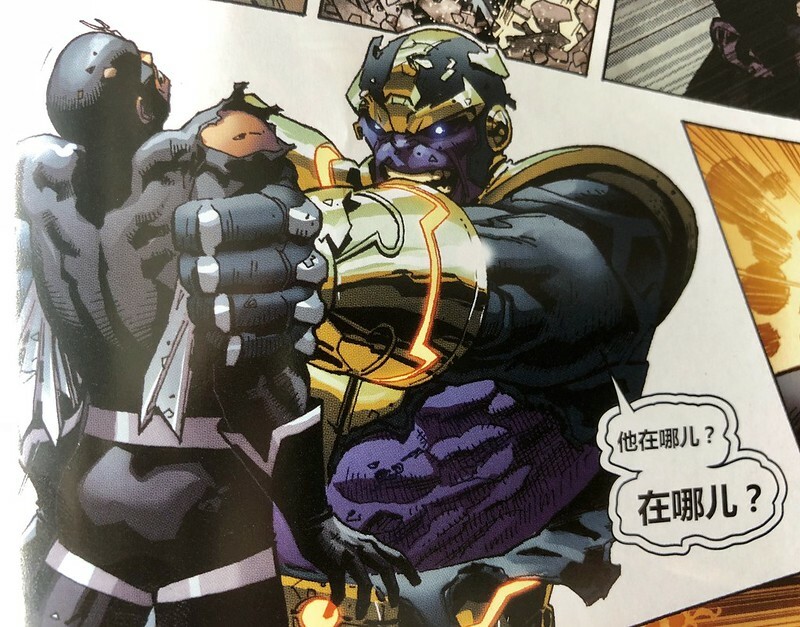 Also, after reading most of the book, doing Google and Baidu searches, and asking several Chinese friends, I’m still not sure what the 丫丫 in the title means. That annoys me. I guess this one is semi-autobiographical. We learn about the married life of the young artist, in comic form. It’s kind of cute, and definitely less morbid than the other book. Unfortunately, it’s still not terribly funny. Again, I like the art, but the “gag” is only good for a smile at best. It caught my attention for its use of the term 河蟹 (river crab), a pun on the term 和谐 (harmonize). I was completely surprised to discover that this book was by far the most entertaining of the three. It seems that the most work went into it (wonder why??). The book gives a humorous history of the Olympics, then goes on to give comic commentary on each event. 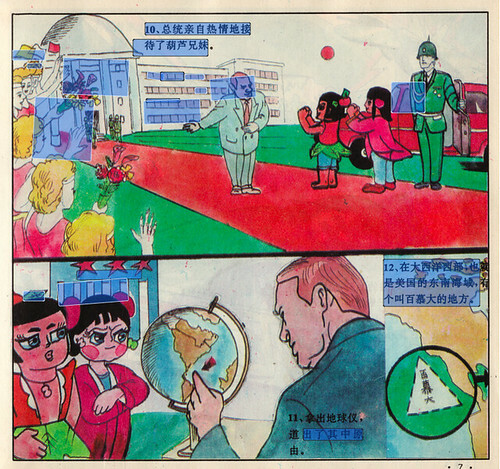 It ends with some lame pro-Olympics propaganda (seems this book was 河蟹d as well). Like I said, I like the style of art. It’s cute and fun, but dark at times. That’s a big plus for me. Unfortunately, 黑背 is not terribly funny (Zhe Deyong is far, far funnier), but the Olympic book showed me that there’s some promise there. I think that the handwritten Chinese characters are a good form of reading practice for a learner of Chinese. Very few Chinese study materials prepare learners for handwritten characters. 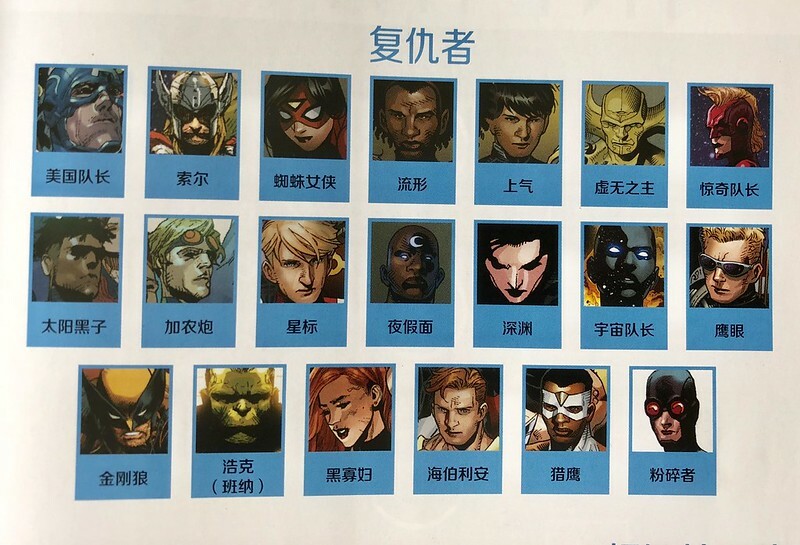 While the characters in these comics don’t look like typical Chinese handwriting, the variation will still be good practice in stretching basic character recognition ability. 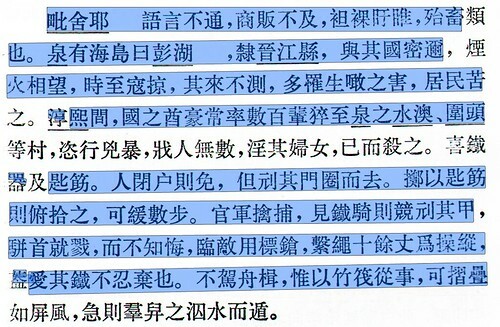 As for vocabulary, the intermediate (and even elementary) learner should be able to read much of 宅男宅女私生活 (see example above), but the others will pose more of a challenge. Ninja teens or ninja teams? Ask the Chinese! I was pretty sure it’s teens myself (rhymes with “machines”… exactly!). Still, in the spirit of “1.3 billion people can’t be wrong,” I had to wonder what the Chinese people thought the lyrics said. Sure, they’re just going on a translation, but whatever the common translation is, that’s what 1.3 billion Chinese people think the song lyrics mean. That’s gotta count for something! 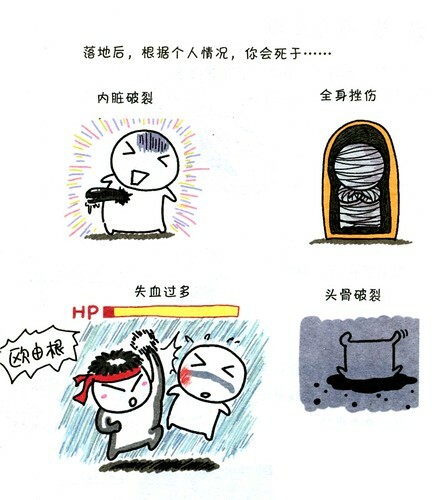 First of all, the Chinese translation confirms the “ninja teens” view (忍者少年)… sorry, Ryan. But looking at the rest of the translation, I must say that there is a thing or two about the translation of these lyrics which concerns me. In the spirit of subtitle surrealism, we better do this whole thing. First comes original English lyrics (in bold), then Chinese “translation”, then re-translation back into English (in brackets). Whoa, did someone sneak an extra word in there? 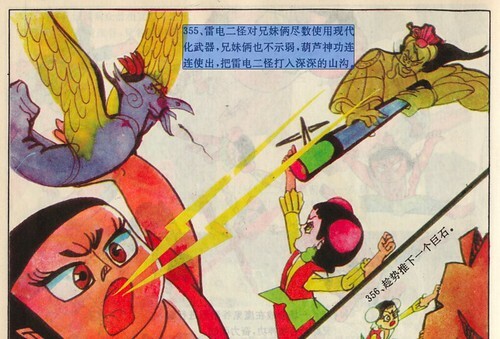 Mostly an exact literal translation, except that the Chinese prefer to call the turtles supernatural turtles (神龟), or “god-turtles,” for the more literal-minded. 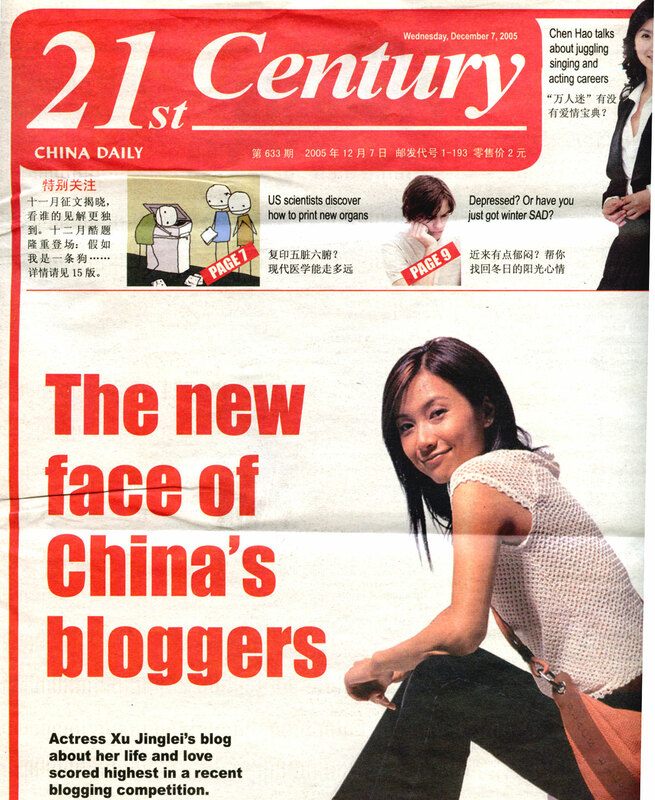 Thinking this particular phrase might have some root in China’s rich cultural heritage, I did a Baidu image search. Hmmm. Lots of TMNT. No legends involving Guanyin and a massive turtle or something? I guess it’s not as important as TMNT. You know… the god-turtles. Hmmm… dramatic, but decidedly less turtley. Hmmm, so these “challenges” the translator made up are fearsome, but the turtles are not? Maybe it’s because they’re god-like. Hey – get a grip! Hey, a turtle is telling you to catch up! That is so cool but crude. “Evil”… “bad egg”… more or less the same right? Yes! 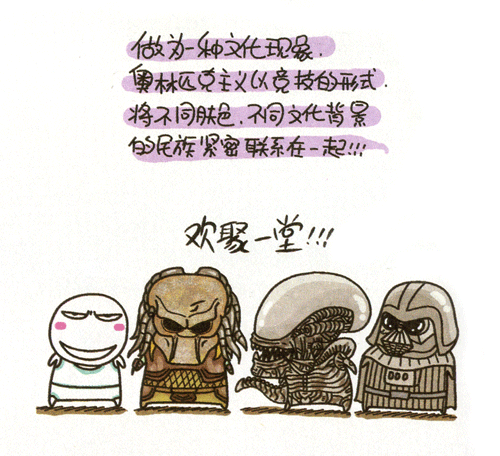 …in Chinese. These Turtle boys don’t cut him no slack! And here you have the translator correcting the original lyricist’s mistake of not giving Master Splinter proper respect. This line has lost the ambiguity of “does machines,” but I guess we won’t miss that. Props for not using “杰克” (Jack). Nice! They even toned it down to just “a bit crude” to save him some face. Yes, he is less crude in Chinese. Well, it’s debatable whether 万人迷 means “mack daddy” or “ten-thousand men love,” but the real question is where’d the “party” go? > April 3rd, 2008: A few days ago T-Rex was considering the “ninja teens” / “ninja teams” issue in the Teenage Mutant Ninja Turtles theme song. I got a lot of emails about that (and here it is nice to be able to say “Man, it’s not me that’s wrong, it’s T-Rex!”) but SECRETLY, I agreed with T-Rex, and thought that the lyrics says “Splinter taught them to be ninja teams”. But guys! I am going to admit that I was wrong. > Here is the fantastic blog post, by linguistics grad student John, that turned me around. It turns out the answer to this debate is (as in most things) to simply Ask The Chinese. Thanks for the link, Ryan! 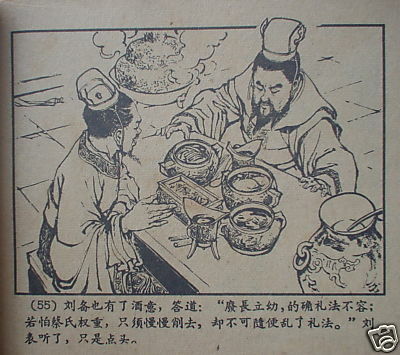 A comment on my Origin of Koi entry led me to the Three Kingdoms Comic. Wow! Impressive. I’m not sure whether to be more impressed by the concept* or by the fact that it’s available in English, Chinese, Japanese, Korean, and Thai! I haven’t gotten a chance to read them all yet, but I definitely will. – Dinosaur Comics. Ryan North’s sense of humor is the greatest. It amazes me how he can reuse the same panels over and over and still manage to crack me up every damn time. – Perry Bible Fellowship. Reminds me of the Far Side, but it’s anything but derivitive. – Nine Planets Without Intelligent Life. Good concept, good (but slow-moving) story. – Beaver and Steve. Weird humor, cute style. – Questionable Content. Indie rock post-Friends twenty-something sitcom comic. – A Softer World. Reminds me of SNL’s old “Deep Thoughts,” with accompanying photography. 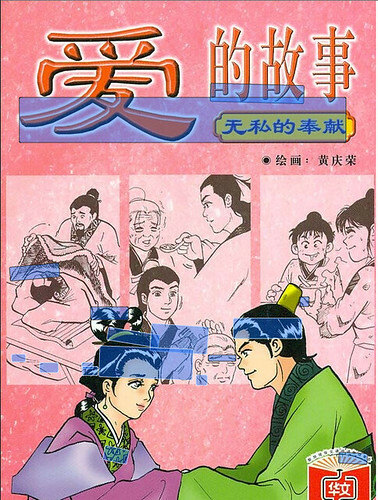 * I know that the story of War of the Three Kingdoms has been done in comic form before, but this is a webcomic. Difference. 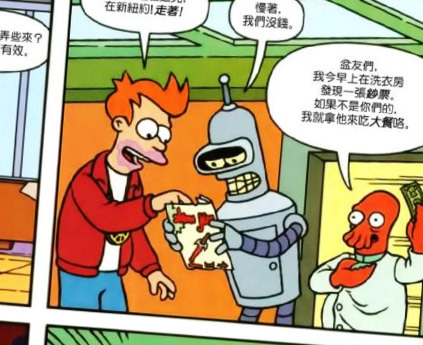 I wrote before about discovering Calvin & Hobbes Chinese translations here in Shanghai, and about how the two characters’ names were translated into Chinese. I got some requests for scans. Anyway, below are the five comic strips I chose to share. I think they have a few interesting translation issues, and they’re Christmas themed to boot. 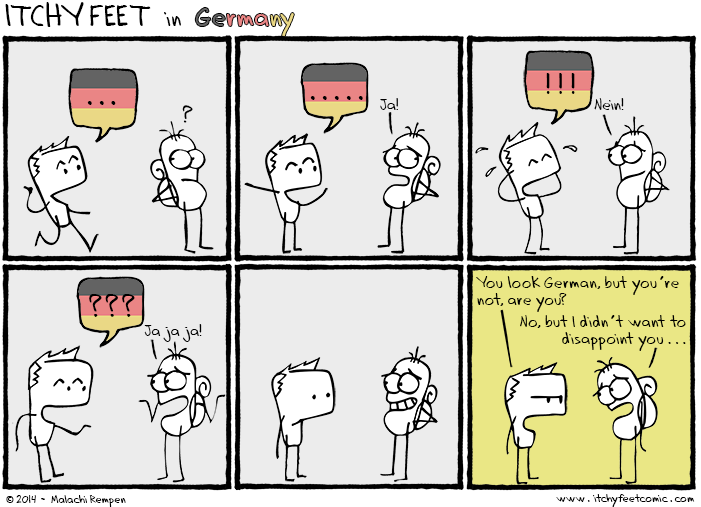 I’m not going to comment specifically on the translations (you readers feel free to go crazy in the comments, though! ), but I did provide the original English beneath each panel, with areas of interest highlighted in red. Finally, I’d like to add that I have nothing but the utmost respect for Bill Watterson, so if what I’m sharing here in the name of translation study is deemed unacceptable by Bill Watterson, I’ll take them down immediately. Higher quality English Calvin & Hobbes scans are all over the internet, though, so I doubt this counts as much. Calvin & Hobbes in Chinese! Ever since I first started reading it as a kid, I’ve always been a huge fan of Calvin & Hobbes. No other comic strip has ever impressed me on so many levels. I remember when I first came to China and brought presents for the special Chinese people that helped me get on my feet, the most prized ones I would give away were Calvin & Hobbes collections. They were one of the few really good items I could think of that you couldn’t get in China. The store had Something Under the Bed is Drooling, Revenge of the Babysat, Yukon Ho!, and Weirdos from Another Planet. Notably absent was the original self-titled collection. I’m really stoked that the Chinese can now share in this cultural treasure. After I got over my excitement, though, I started wondering… how good could the translations be? The titles of the two books I picked up were translated OK. Something Under the Bed is Drooling became “Who is under the bed drooling?” (谁在床下流口水), and Yukon Ho! 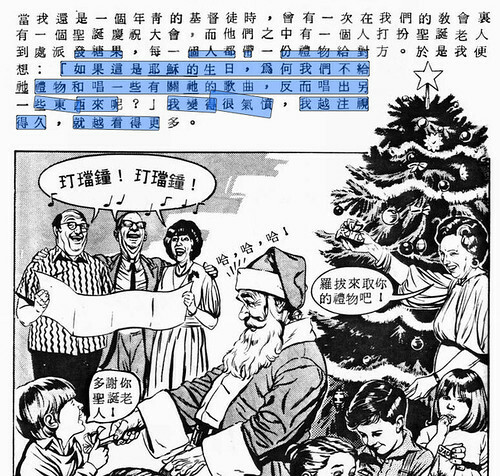 became “Off to the North Pole” (到北极去). More disappointing were the names of the two main characters. Most fans know that Calvin was named for theologian John Calvin, and Hobbes was named for political philosopher Thomas Hobbes. I know I’m no translator, so maybe there were good reasons, but it was sad to see Hobbes’ name translated as something like “Jumpy Tiger” (跳跳虎). That name seems much more appropriate to Winnie the Pooh’s friend Tigger, whose Chinese name also happens to be — guess what? — 跳跳虎. “Hobbes” in Chinese is 霍布斯. Not cute enough, I suppose. Calvin’s name became 卡尔文, which is very close to the preferred Chinese transcription of the theologian’s name, 加尔文. Unfortunately, the transcription 卡尔文 is the one used for Calvin Klein’s Chinese name. But what’s in a name? 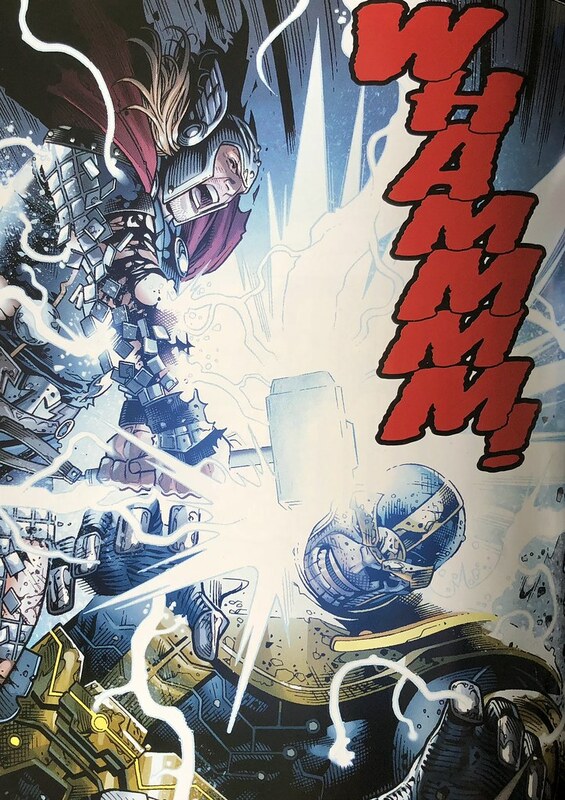 The real test is how the comics themselves read. I don’t have the books anymore; I sent them home with my girlfriend under strict instructions to read and enjoy ASAP. Hopefully I’ll know soon. 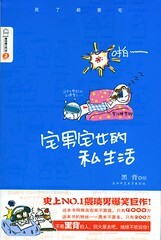 If she doesn’t love Calvin & Hobbes, I’ll be forced to conclude that the comics must be poorly translated into Chinese.